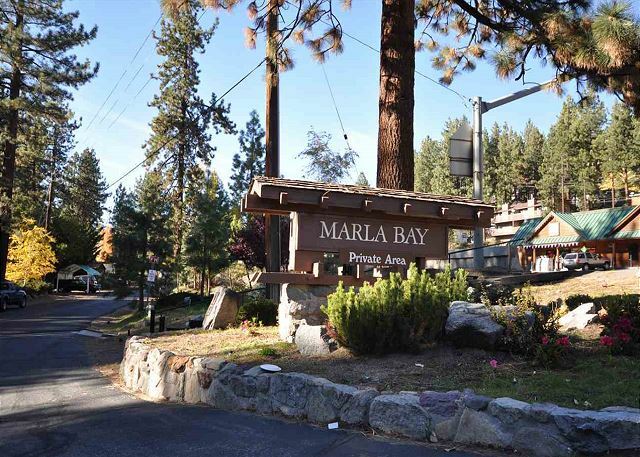 Tallac Lodge is located in the private lakefront community of Marla Bay near Zephyr Cove. 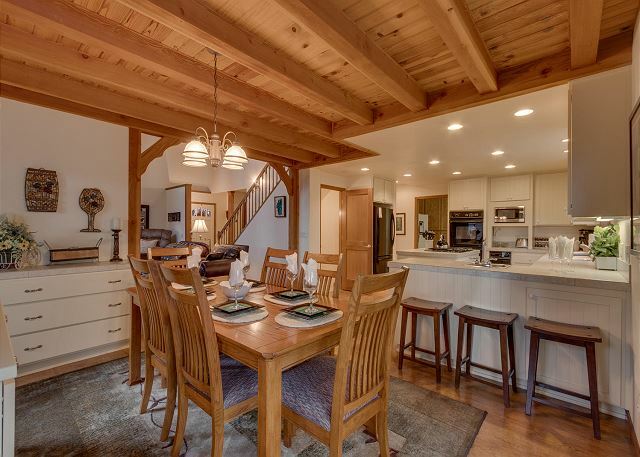 It features four bedrooms plus a loft and sleeping for 12 guests. 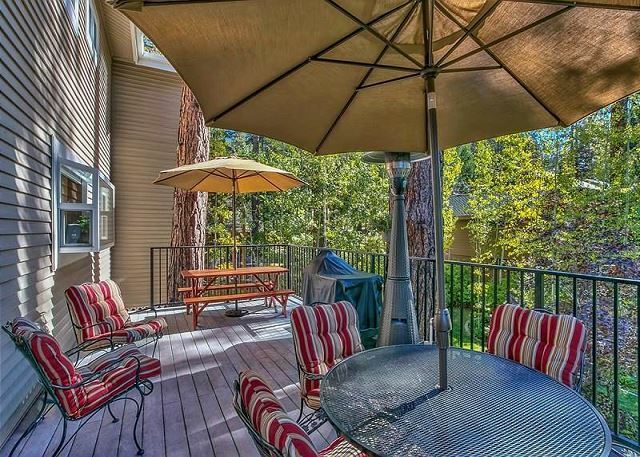 This luxury home is three levels, and a great deck area for relaxing with guests. 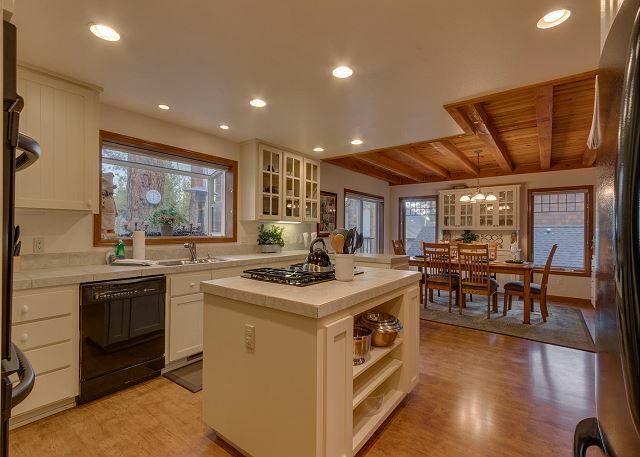 You will enter into the 2nd level of this home to the living room, kitchen & dining area. 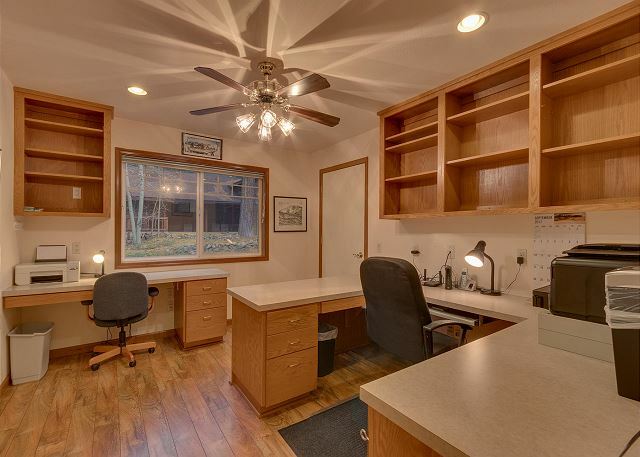 The office is to the left of the front door and through there is access to the garage. There is a large laundry room off the kitchen and you can also access the garage through there. Off of the dining are is the deck with a BBQ for enjoying outdoor dining with guests. In the living room is a large flat screen TV and a cozy gas fireplace. Through the kitchen are the stairs down to the 1st floor. There you will find bedroom 1 with a bunk bed that has a twin on top and a full on bottom also a trundle bed with 2 twins, there is a TV in this room long with a coffee maker, microwave and mini fridge. 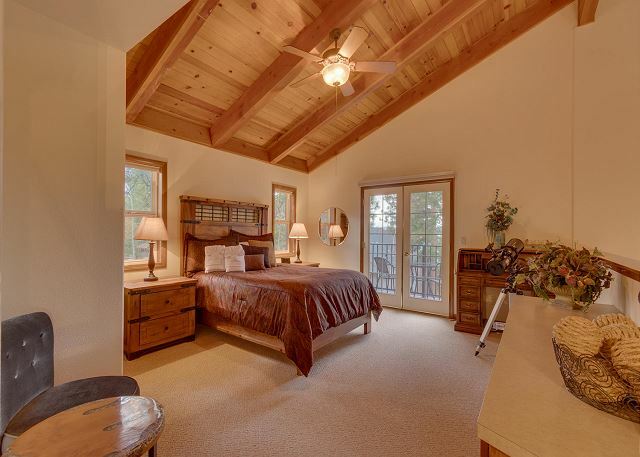 Through this bedroom is bedroom 2 with a queen and a full bathroom with a stand up shower. There is a door to the outside from bedroom 2, this is a nice feature for a multi family vacation. To access this bathroom you do walk through bedroom 2. Above the living room is level 3 with a loft over looking the living room and a small balcony that has a partial lake view. In the loft is a queen bed. 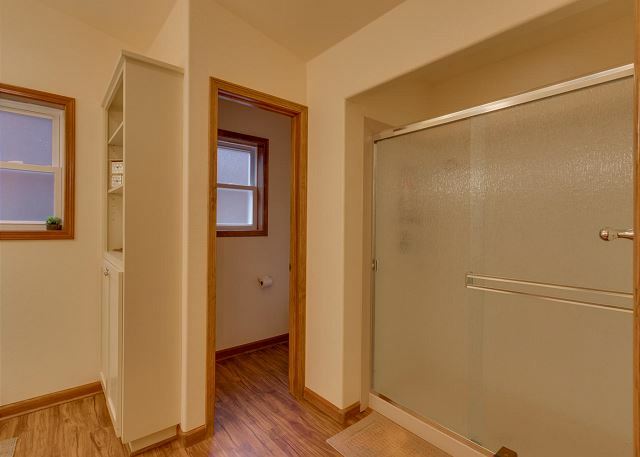 Down the hallway is a full shared bathroom with a tub and separate stand up shower. Bedroom 3 with a twin and full. Bedroom 4 that is the master with a king bed, TV and a large master bathroom with a tub and a separate shower. Marla Bay is a private lakefront community, only a 6 minute drive away to Stateline where the majority of our shops, restaurants, and vibrant nightlife is located. The nearest grocery store is only 1 mile away, in the Round Hill Mall. During the winter, you and your guests are only 6 minutes away from the Heavenly Mountain Resort Gondola where you can access the ski slopes. 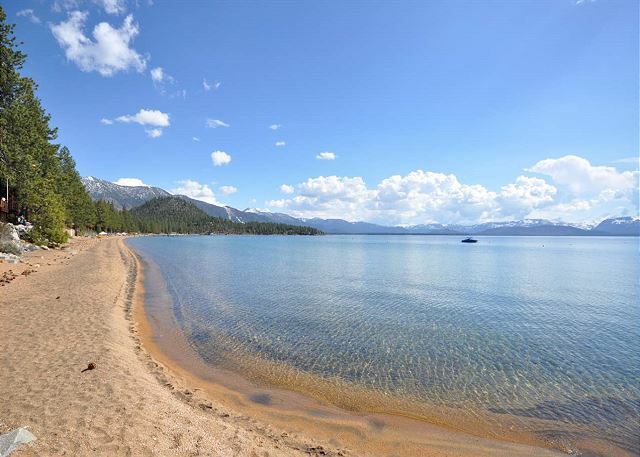 During the summer, you only have to walk across the street to be on the sandy shores of Lake Tahoe. You cannot get a much better spot than the Marla Bay community beach. 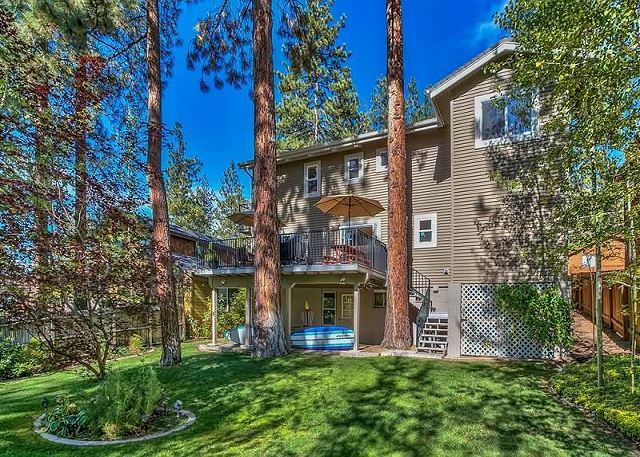 If you are looking to explore other public beach spots on Lake Tahoe, Zephyr Cove Resort is just a quick two minute drive north, while Round Hill Pines and Nevada Beach a few minutes south. Each of these three Nevada beaches offers something different, with Nevada Beach being the only one without facilities. Both Zephyr Cove Resort and Round Hill Pines Beach Resort offer dining, drinks and boat rentals. Your beach day options are endless! 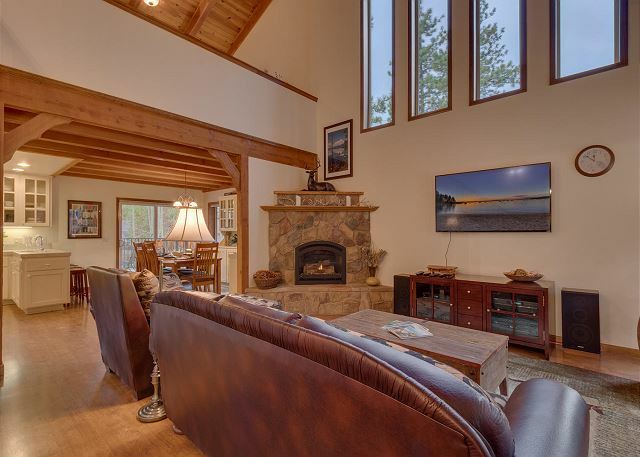 Let the Tallac Lodge be your next vacation rental for your trip to lovely South Lake Tahoe! 2. You are only allowed 12 persons at any time at the house. This includes any dinners or gatherings you may have. We lived staying at this house. It was clean and spacious. It had enough beds, blankets and towels. We enjoyed our time there. 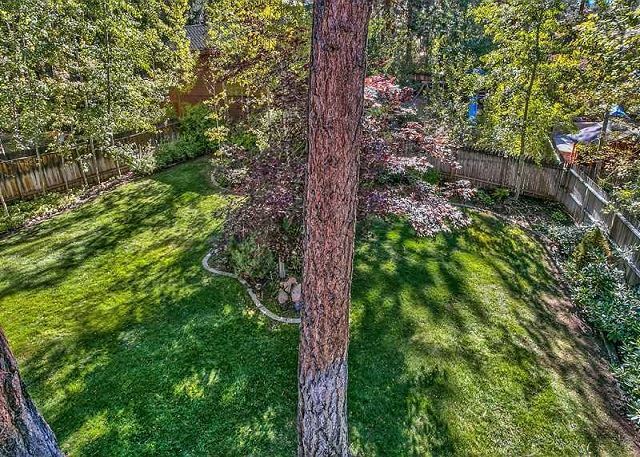 Perfect location for a family with children and steps away from the lake. There are alot of steps and if you have young children we'd recommend bringing a baby gate. 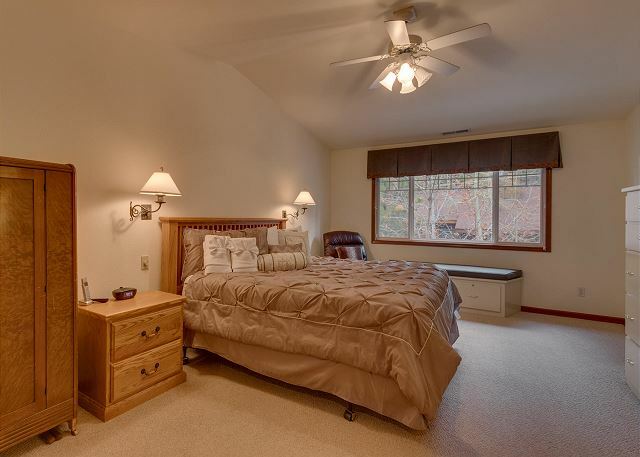 The lower level is a perfect place for the kids sleeping up to 4 with an adjoining bedroom/bathroom while accomadating adults in the upstairs bedroom. The 3rd bedroom upstairs is in the open loft (The photos are true to the home)This home feels like home having plenty of room, a well equiped kitchen, office to work and a large laundry room, games for adults and kids, flat screen tv's, barbeque, large deck with a bonus of a beautiful backyard. The lake level is at capacity and there wasn't much beach, but that changes from year to year. We've been staying up in this area since our kids were small and its a quite neighborhood with lots of people walking in the morning along with the local bear and close to Zephyr Cove, grocery stores and the casinos. It was unusually warm during our stay; however, there are a/c units that allow you to cool the upstairs. We look forward to staying in this home next year with our family. Thank you for renting from us, we hope to see you again next year. Excellent home. Beautiful views. The house has everything to make the stay comfortable and fun. The property management were fast at replying to my questions. Great team to work with. Thank you for renting from us. We are glad that you enjoyed your stay. Hope to see you again.